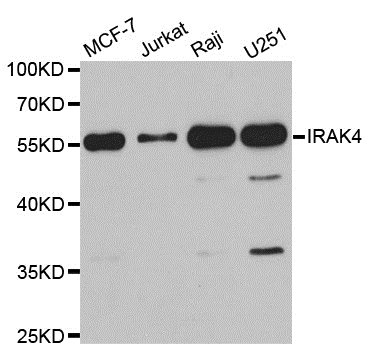 Rabbit anti IRAK4 antibody recognizes human IRAK4, also known as interleukin-1 receptor associated kinase-like 4. IRAK4 unlike IRAK1-3 lacks the C-terminal domain required for TRAF6 interaction. Antiserum to IRAK4 was raised by repeated immunization of rabbits with highly purified antigen. Purified IgG was prepared from whole serum by affinity chromatography.